The 112th post from the Journal of American Greatness originally published in June, 2016. The 107th post from the Journal of American Greatness originally published in May, 2016. We doubt any angry Trump supporters have literally put these two stories together. Our doubts would be valid even if we believed more than a trivial number of Trump supporters read the New York Times. Still, the twopieces fit together like a yin and a yang. The first is about North Wilkesboro, NC—a dying, formerly industrial town quite close to the fictional Mayberry, where Sheriff Andy Taylor dispensed gentle justice for eight years in the 1960s. The social center of town is no longer Floyd’s barber shop but the “vape shop”—i.e., the dispensary of e-cigarettes in various exotic and improbable flavors. There is no hope there. The textile mills and furniture makers—long the bedrocks of the local economy—have either closed or so reduced their output that barely anyone can make a living. The only person who seems to make any money is the local lawyer who defends his former high school classmates against drug charges and represents them in family court. Trump is very popular in North Wilkesboro. The second is about a town where Trump is very unpopular. President Obama, we recall, will break tradition and stay on in the capital after his term ends. Naturally, he’s got a swell place lined up. That’s not the interesting part. The interesting part is that this $6 million, nine-bedroom home in Washington’s very fanciest neighborhood—where Donald Rumsfeld, who had been a Big Pharma CEO, lived when he was SecDef; where also sits the French Ambassador’s magnificent Tudor, a home grand enough that Vanity Fair chooses it as the setting for their legendary “please-ya-gotta-lemme-in” White House Correspondents Dinner after-party—this fine home befitting a soon-to-be former President of the United States is owned by … Joe Lockhart. Let that sink in for a moment. Joe Lockhart was one of Bill Clinton’s five Press Secretaries. Not one of the famous ones, either. Now, Press Secretary is not an easy job. It requires an agile mind, a way with words, and a command of policy and politics. It’s also high-profile. No surprise, therefore, that talented people find their way to the James S. Brady Press Briefing Room podium, become well-known, and later do very well for themselves. Capt. Charles Hamilton Maddox, a veteran of both world wars, who in 1912 designed and tested, in-flight, the first successful radio equipment used in Naval aircraft. His daughter, Muriel Maddox, acted alongside Marlon Brando in the movie “The Men” and wrote a number of romance novels. The neighborhood has long been home to prominent politicians, including Woodrow Wilson, William Howard Taft, Franklin D. Roosevelt, Warren G. Harding, Herbert Hoover and Senator Edward M. Kennedy. Socially and economically, Press Secretaries have come a long way! The article notes that, until recently, Lockhart had worked as “the managing director of a communications and political consulting practice he founded, the Glover Park Group.” I.e., the fortune that Lockhart “earned” to buy Captain Maddox’s house was acquired through the typical rent-seeking—or, to be more precise, the facilitation of rent-seeking—practiced by virtually everyone lucky enough to score a high-level, high-profile Washington government job. How does that compare with designing and flight-testing the first successful radio equipment used in Naval aircraft? In any event, we don’t know the exact figures, but you can bet that the price of that home has soared well beyond inflation as the contributions to society of its residents has plummeted. A fitting commentary on what 2016 America “values” in contrast to America circa 1928, no? Meanwhile, down in North Wilkesboro, people who used to actually make things that improved lives and boosted the GDP of our country are poorer than they’ve been since the Great Depression. There is perhaps not a strict 1:1 relationship between the poverty of North Wilkesboro and the tidal wave of wealth washing over the Beltway. It’s not like Washington is robbing the former to pay for nine-bedroom mansions in Kalorama. Is it? No, that would be too obvious. It’s rather that rentiers like Lockhart get rich helping even bigger rentiers get even richer by pushing policies that favor the Davoisie agenda, which acts as an irrigation system to drain cash and opportunity out of places like North Wilkesboro and pour it into Washington, D.C. and its surrounding counties. It really does take a Conservative Pundit not to understand the appeal of Trump. The 106th post from the Journal of American Greatness originally published in May, 2016. We at JAG seem to enjoy bashing the neocons. This might give some the impression that we have no respect for them at all or that we deny or disdain any and all of their accomplishments. Not so. The neocons were once a mighty force for good, on two principle scores. You might even say three, but three cheers would be too much in the current environment, in which they definitely deserve some jeers. However, we will mention all three in the interest of fairness. First, the neocons were the first significant cadre of leftist intellectuals to break with the left and move rightward. This was an epochal event in ways that are no longer sufficiently appreciated. From the moment that Communism began to gain political strength in the late 19th century, the left showed amazing esprit de corps and “message discipline.” The few who did break with them—Chambers and Dos Passos, for instance—were essentially declared non-persons and drummed out of intellectual life or else ghettoized and read only by their new friends on the right. The neocons, by contrast—in part because of their origin on the left and personal relationships with leading leftist intellectuals—were able to make the break and keep their “intellectuals license,” to retain the recognition (however grudging) from their former allies that they were genuine thinkers who had to be taken seriously. A related factor, which we hesitate to mention lest it provide aid and comfort to alt-right anti-Semites, is of non-trivial importance. Painting with broad strokes, we may say the pre-war liberal intelligentsia (Edmund Wilson, doyen) was not substantially Jewish. But the postwar liberal intelligentsia (Lionel Trilling, doyen) was definitely trending Jewish if not monolithically so. To be taken seriously it was almost essential to have some connection to the New York Intellectual scene, which included a large number of influential Jewish voices. New York felt it could safely ignore the likes of Russell Kirk. It could not ignore Irving Kristol, who was emphatically one of its own—a prodigal son. Thus all of the sudden many on the left felt they had to take the right seriously. Not to agree with it necessarily, but to treat its arguments as if they were at least worthy of refutation. This is something that the dominant leftist intellectual culture had not felt it necessary to do for several decades. It had the effect of legitimizing the intellectual right and so paving the way for its later successes. So that’s (half)-cheer number one. The first full cheer follows directly from it. The early neocons were brilliant on substance. Let’s not deny or overlook that fact. They brought an intellectual rigor to left-dominated social science that used the tools of social science to bolster long-asserted conservative insights with hard data. Conversely, they were the first to use the social science methods of the hubristic post-War liberal consensus—which held that “science” was going to cure “the ills of the cities” even more effectively than philosopher-kingship—against that consensus. The early neocons, like intellectual jujitsu fighters, seized the left’s tools and used them to demonstrate the vacuity and failures of the left’s social programs. A great deal of successful conservative social policy—crime reduction, welfare reform and much else—has followed this trail first blazed by the neocons. Neo-conservatism is today most associated with foreign, not domestic, policy. This brings us to our second full cheer. A common thread uniting the original two camps of neocons is apostasy: both, as it were, rebelled against their ancestral faiths. The foreign policy neocons were Cold War Democrats appalled by America’s betrayal of South Vietnam, the McGovern nomination, and the Nixon-Kissinger policy of “détente.” They intuited—it turned out correctly—that American weakness was making the world more dangerous, that the Soviet Union need not be accepted as a permanent geopolitical fact, and that renewed American strength would enhance American interests and could change the world for the better. Ronald Reagan and many others on the right came to all these conclusions independently—and, as the Nixon-Kissinger point illustrates, in defiance of their own political party. The informal migration of the Cold War neocons to the intellectual right, followed by their formal entry into the Republican Party, helped conservatives within the Party win the argument on foreign policy, which strengthened America and helped win the Cold War. These two momentous achievements deserve two rousing cheers. But how did they translate into the Middle East democracy agenda? We can speculate as to the answer. First, the conservative critique of Bill Clinton’s foreign policy fecklessness was generally correct. Hence, especially after 9/11, the bumbling of the late 1990s looked in hindsight a lot like thebumbling of the late 1970s. A reassertion of American strength was paramount, said the neocons. To this extent, we agree(d). Second, the 1970s foreign policy neocons won the argument with the “realists” over the efficacy of using human rights and other moral considerations as cudgels with which to batter the legitimacy of Communism generally and the USSR specifically. However, the application of this principle to the Middle East proved both unnecessary and unwise. Ironically, the original neocon fealty to empirical social science should have revealed the unwisdom—the impracticality—of the democratization dream. But by then neo-conservatism had ossified into an ideology. Which points to the other common thread uniting the first two generations of neocons. They were responding to the exigencies of their times. To meet those exigencies, they formulated new ideas, or adapted old ones, specifically tailored to the circumstances they (and the country) faced. Compare that with today’s “neocons” who—if one thinks about it—barely deserve the name. There is nothing “new” about them. All they do is take decades-old formulas and force them on times and circumstances to which they are manifestly unsuited. Worse, unlike their forebears, they seem incapable of learning from their mistakes or changing their minds. In Irving Kristol’s famous formulation, a neo-conservative is “a liberal who has been mugged by reality.” I.e., who has changed his mind in response to undeniable fact—especially in the face of the obvious failure and untruth of what he once believed. When was the last time you saw a Kagan or aBoot do that? The elevation of time-bound policies—however efficacious in the moment—to high principle is the principal malady afflicting intellectual conservatism today. Not just neo-, fairness compels us to add, but all brands, with and without prefixes. In not understanding the grounding of the good and natural right, conservatives mistake second- and third-order strategy and tactics for uncompromisable holy principle. Genuine eternal principles are difficult to grasp and rarely (if ever) “supply us with recipesfor today’s use.” One of the reasons that the great works of political philosophy are so hard to understand is that their authors wished to avoid having their teachings rotely applied to transient issues. There are at once many more, and many fewer, than 48 laws of power. No political formula ever works in perpetuity. Prudence is always a requirement of sound statesmanship. The original neocons had it. Their intellectual children and grandchildren don’t. The 105th post from the Journal of American Greatness originally published in May, 2016. As became clear in 2008 (if it wasn’t already clear before), interconnectedness in financial markets is a significant part of systemic risk, even though in some cases it ameliorates risk. Global connection within a market, connection across markets and the financialization of all markets bring both opportunity and risk. When sectors of the American economy are heavily connected, whether at the point of manufacture or at the point of sale, with far-flung parts of the globe, every part of their manufacturing and sale process is also made more fragile. It is not always a boon to “antifragility,” as the book had it some years ago. The companies that have weathered the recent turmoil in emerging markets and Europe have been those able to sell their goods domestically regardless of the vagaries of overseas market conditions. The strong dollar has weighed on exporters, but much less so on domestic firms selling their goods locally. Such news doubtless comes as a shock to those knowing conservatives who knew all along and still know that globalization is the future and get on with it and let’s build the future. It’s a perplexing stance, in response to which Peter Thiel sensibly noted (in this week’s Conversations with Bill Kristol) that the lead stages of globalization are already behind us. Yet the conservative horror at Trump’s trade proposals pretends that globalization is all in the future. The Journal‘s simple report is no longer common sense. Why not? IT DOES NOT REQUIRE “PRINCIPLES” to recognize that firsthand knowledge of one’s countrymen often puts one at a market advantage over those who are from abroad. In making this observation, our purpose is not to argue that trade should only be domestic, or that exporters of products genuinely needed at a foreign market are at a permanent disadvantage. Coffee-growers in Latin America have to export their product to American roasteries, and individual coffee plantations are at no market disadvantage compared to selling on their home markets since in many cases a foreign market is required to move product. Trading on one’s strengths fully comports with the Greatness Agenda outlined by JAG. The Principled crowd for whom free trade is a Principle, however, wrongly assume that the global direction of free trade in many market sectors means that domestically focused manufacturing is increasingly unnecessary or even undesirable. They also wrongly point to the overall glossiness of American manufacturing statistics to excuse the decline in manufacturing employment, as though it doesn’t matter if anyone works so long as we’ve got the things. The problem with elevating free trade into a principle of Principled Conservatism is not that protectionism is the proper opposing principle, but that the application of domestic principles to foreign trade inappropriately hamstrings American policy-makers. All these points are intuitively obvious, yet they’re overlooked when the cultural consensus regarding global capitalism points would-be manufacturers to look abroad. Even if Trump’s call to “Make America Great Again” serves no other purpose, it assists however modestly in reorienting potential capital investment domestically. We harbor no illusions about the difficulty in doing so, not least from the pressure brought upon companies as they seek to finance their expanded operations. The drive toward outsourcing manufacturing, geographically separating design and manufacture, separating production from market, and even separating each part of the manufacturing process are all aspects of culture and not simply market operations. Changes to American trade policy must be preceded by a cultural transformation toward identifying a link between economic production generally and national greatness. The attempts to minimize the phenomenon of Trumpism, to explain it away or to lob cheap (foreign-produced?) insults at its messenger overlook the importance of that simple change. FORGOTTEN IN THE DISPUTES over Trumpian trade policy is the fact that in the United States, domestic trade is free trade—free across the borders of American states. The drive for free trade within the U.S. was a constituent part of the nation itself and not merely its constitutional settlement. That constitutional permission of trade across state lines formed the American commercial psyche and so formed the nation itself. This difference is found in other aspects of American constitutional practice, as well. One cannot say that “liberty of speech” is good such that the American government is equally obligated to protect the liberty of speech of its citizens and that of resident aliens, guest workers, travelers and the like. Similarly, the evident goodness of trade tells us, on its own, not a single thing at all about what our attitude toward Chinese steel dumping should be at a particular moment. (Much to the Cato Institute’s chagrin, Reagan violated the principles of free trade on numerous occasions. George W. Bush did, too!) Similarly still, the goodness of living under a representative democratic government in itself tells us nothing about whether to allow some particular immigrant to apply for U.S. citizenship. A sovereign state has the right to close its borders to any group or to open them to any group. None of these “nothings” tells us that these things are forbidden, either. We may well establish a mutual abolition of tariffs on certain goods with a certain country at a certain time. We may well admit high-skilled workers from European countries, or even Canada, to come to the U.S. and apply for citizenship. Our evaluation of those matters is one of prudence in the interest of American greatness. Though we disagree with their analysis on other respects, conservatives who link trade policy to foreign policy are at least on the right track. Williamson’s argument that “Free men do not have to beg the prince’s permission to buy from or sell to whom they choose” is simple obscurantism. Those who treat free trade as an absolute principle often seem to imagine that America is a very small state with limited national resources, almost entirely dependent on foreign trade to leverage its handful of industries in favor of purchasing basic goods from abroad. Yet the forty-eight contiguous states (and the additional far-flung pair) were gathered in time across a continent rich in natural resources, harboring a variety of climates, and filled with people with a knack for commercial ingenuity. America’s commercial ingenuity is part of the strength that it can use for the purposes of preserving and extending national greatness. A sly comment in National Review‘s most recent paean to free trade agreements admits that it would be “almost certainly impossible” for the U.S. to pursue protectionist policies even if it wanted to. The reason why is telling. “U.S. manufacturers,” writes Scott Lincicome, “have evolved over decades to become integral links in a breathtakingly complex global value chain—whereby producers across continents cooperate to produce a single product based on their respective comparative advantages—that could not be severed without crippling both them and the global economy.” The complexity of global manufacturing chains is part of the reality that Lincicome’s glossy statistics overlook. Comparative advantages are becoming ever more fungible and easily replaced. Simply occupying a little spot in the global supply chain may not be enough to keep American manufacturers in the supply chain. When the whole supply chain is located domestically (and again, we are not elevating that as a Principle), the matter is different. How the principle of American greatness became lost and regarded as the antithesis of a principle by Principled Conservatives is the story of conservatism’s decline. “There shall be free trade on the part of the United States” is not a Principle but the abdication of political judgment in matters pertaining to American strength. When the Wall Street Journal has to call everyone’s attention to the comparative advantage of domestic manufacturing itself, maybe our Principled friends will start to think of ways to shore it up. The 104th post from the Journal of American Greatness originally published in May, 2016. As noted, we liked Trump’s foreign policy speech. Among the many things we found in it to like, perhaps the most important is Trump’s forthright (and correct) assertion that America still has dangerous enemies and will need to remain ready, willing and able to fight them. One might respond that we are cheap dates, given that every Republican nominee in the last half-century at least has pledged the same. But America’s post-9/11 wars, especially Iraq, have scrambled all the usual formulas and expectations. Certainly, in the 2016 cycle, there was no shortage of Republican candidates pledging to Get Tough on America’s enemies. The problem was that nearly all of them were also neocon democracy crusaders. This is now a highly unpopular position in the Republican Party, which explains in large measure the enthusiasm for Trump. Yet—at least at the intellectual level—those Trump supporters who see the folly of the democracy agenda tend toward their own brand of folly: the isolationist illusion that, whatever enemies we may have, hate us mostly in response to our own provocations and—like proverbial bees and bears—if we didn’t bother them, they wouldn’t bother us. Foreign policy on the “right” is thus a choice between two brands of naïve utopianism: either more pointless war or endlessly turning the other cheek. That was the Republican choice until Trump. Or, at least until Trump and Cruz who—for all his other faults—at least presented a positive turn in Republican foreign policy (though not entirely in his choice of advisors, some of whom seem to think The Manchurian Candidate was a documentary). And then there’s ISIS. I have a simple message for them. Their days are numbered. I won’t tell them where and I won’t tell them how. We must as, a nation, be more unpredictable. But they’re going to be gone. And soon. Now, we have some quibbles with that. First, Trump should have mentioned al-Qaida, which, despite the Obama administration’s transparently false assertions, is stronger than it’s ever been. (It controls more territory in more countries today than it did before 9/11.) And it’s probably more dangerous than ISIS. Second, to promise that ISIS is “going to be gone” is to overpromise, in that there is no sure to way to ensure that short of a massive invasion and long occupation of the kind that Trump rightly eschews. But we may dismiss that as campaign rhetoric. However, that’s not what drew the guffaws. It was Trump’s promise of unpredictability that had themlaughing from the gallery. But on this Trump was exactly right. Some of the best and most profound strategies are captured by very few words. Trump’s eleven, properly interpreted, fit our current needs to a “T.” We shall attempt to explain how. Doing so will require a seemingly circuitous route through what appear to be side roads. However, for those who persevere, one may see the design of the author in the design of the post. Did you hear the one about the truck driver who built a nuclear weapon? No, seriously. Now, it’s not a full-on Teller-Ullam two-stage thermonuclear metropolis-killer. It’s merely an exact—exact—copy of Little Boy, the HEU gun-assembly bomb that destroyed Hiroshima on August 6th, 1945. The trucker’s bomb lacks only two things to make it go boom: the cordite priming charges to fire one part of the highly enriched uranium core into the other, and that uranium core itself. The first would be easy to get but dangerous to carry around. The second would be quite hard indeed to get. Which is probably, at this point, the only reason why a home-made Little Boy or something very much like it has not been detonated at 42nd and Vanderbilt or 17th and G. Don’t kid yourself: they want to. We’re not going to repeat the case for how we know that, because we’re not specialists in it and others are far, far better equipped. If you’re an alt-righter or paleo-isolationist who thinks all we have to do is end the U.S.-Israel alliance, and the whole Muslim terror problem will go away, this Journal will be a consistent source of anger and disappointment to you. They’d still want to nuke us. And, given the material, they could. “The secret of the atomic bomb is how easy they are to make,” our trucker has observed. The conventional wisdom of the foreign policy establishment, ably summarized in this paper, is that such an occurrence, while not impossible, is so unlikely that U.S. policy should focus its energies elsewhere. It’s unlikely, the authors argue, because of the high likelihood of establishing attribution, and thus a target against which to retaliate. Hence any state in possession of nuclear materials (and only states possess such materials in necessary quantities) would never dare use such weapons themselves or give nuclear materials to terrorists. The paper is thorough and for the most part honestly weighs most of the arguments (which we will not summarize) for and against its conclusion. Yet we are not convinced by that conclusion, or that the facts the authors themselves present warrant it. Their case for certainty (or near certainty) of attribution rests on two foundations: first, the ability of “nuclear forensics” to determine the origin of a bomb’s fissile material, and second, the very good track record (so far) of fixing attribution for conventional terror attacks. Let’s examine these in reverse order. The authors show that just under half terrorist attacks committed since 1998 (the year al-Qaida bombed the U.S. embassies in Kenya and Tanzania) have been definitively traced to their sources. The attribution rate rises with an attack’s fatality count—mass casualty (>500) attacks have an almost 100% attribution rate—and depending on the target. Attacks against the U.S. and our allies are much more likely to be attributed. All well and good. But a near 100% attribution rate for attacks against the U.S. or allies that killed more than 20 people has hardly stopped terror. More to the point: a nuclear terror attack would have to have at least two sources: the terrorist group itself and the state that provides the fissile material. The high attribution rate on which the authors hang so much refers only to the terrorist group and not the state. Not that they ignore the state; we’ll consider what they have to say about states shortly. The point is simply that knowing which terrorist group hit you is not the same as knowing which state was behind them. And, to say the least, terrorist groups are much less deterrable than states: their raison d’etre is to commit attacks. They are also much harder to retaliate against, especially without the cooperation of the states that harbor and support them. The authors furthermore do not address several very important points. The 9/11 attacks were carried out by a terrorist group (al-Qaida) with the backing of a state (the Taliban regime in Afghanistan). Neither were deterred by the prospect of American attribution and retaliation. Either one or the other (or both) of them didn’t think the attribution would or could be made, didn’t believe the United States would follow through, thought they could withstand whatever retaliation might come, or simply didn’t care about retaliation and judged the attack itself to be much more important than any ensuing negative consequence to themselves. Similar thinking along any of these lines may similarly motivate some other terrorist-state combination to try again. As an aside, we may ask: does anyone believe that had al-Qaida been able to access a nuclear weapon in the 1990s (which they tried and failed to do) and get it into the U.S. (not a difficult thing to do, alas) they would not have used it? Even more important, while the authors put 9/11 unambiguously into the “attributed” category, the truth is not quite so neat. Certainly we know that al-Qaida was behind the attack, that al-Qaida was at that time headquartered in Afghanistan, and that the Taliban knew of and helped with the 9/11 plot. But the 9/11 Commission also found evidence of Iranian involvement, which it urged should be investigated further. It never has been. A Senate inquiry also found at least some evidence of Saudi involvement, but the pages of its report that detail those findings remain classified. So it’s at least possible that other states were involved, their involvement has never been proved, and they’ve consequently never faced any retaliation. The authors of the paper assume binary alternatives: state-sponsorship is either “known” or “anonymous.” “Suspected but not proved” they do not analyze, even though there are several recent cases of such. If indeed some of those suspected are in fact guilty, the lesson that such states (and others) would draw is that muddying one’s involvement in a terrorist plot enough to escape retaliationis possible. A further lesson: the likelihood of escaping retaliation goes up if you’re but one of several countries in on the plot. Even when attribution is known, the United States does not always retaliate. One big reason why, since 1979, Iran has remained, with very few exceptions, very aggressive toward U.S. interests—even to the point of killing American soldiers and Marines in Iraq and Afghanistan—is because we so rarely ever hit them back. For example, we didn’t retaliate after either the 1983 Marine barracks bombing in Lebanon or the 1996 Khobar Towers attack in Saudi Arabia. On the occasions when we DO retaliate—such as the 1987-88 actions that sunk half the Iranian navy—the regime’s behavior subsequently becomes much less aggressive and much more circumspect. For a while—until they realize that we have reverted to passive form, as we always do. The principle reason why America behaves this way is not exactly calculated to make enemies fear us. In the three years between the degeneration of Iraq into anarchy and the beginning of the Surge, Iran operated several “rat lines” of men and materiel in to Iraq. Much of the munitions used to build IEDs that killed and maimed American soldiers originated in Iran. On a smaller scale, Iranian fighters sometimes fought with Iraqi Shia militias and killed American soldiers with their own hands. For years, American policy-makers knew of this, did nothing about it, and denied it was even happening. Why? The staff director of the 9/11 Commission, and principal author of its report, noted that once American officials acknowledged the truth, they would have been obligated to do something about it, which risked wider war with Iran, a risk few in the (allegedly war-hungry) Bush Administration were willing to take. Yet when the Surge began, one element of the strategy was to shut down those rat lines, which meant engaging Iranian fighters. Which we did, and the rat lines were shut down (for a while). With no wider war. All of this is to say, even the certainty of attribution is not necessarily an effective deterrent—especially when you know your target has a track record of inconsistent retaliation. Nuclear weapons are the most powerful weapons a state can acquire, and handing that power to an actor over which the state has less than complete control would be an enormous, epochal decision—one unlikely to be taken by regimes that are typically obsessed with power and their own survival. The authors don’t exactly deny—but don’t forthrightly disclose either—that this has already happened. About a quarter century after the fact, American intelligence pieced together that in 1982 or 1983,China gave a finished nuclear bomb to Pakistan. (This is to say nothing about the myriad other instances of state-to-state cooperation on nuclear matters; no state—not even the United States—has ever built the bomb on its own.) This is not the place to go into the “why” of that decision, even to the limited extent that we understand it or to which it can be understood. It is rather only to make the point that even one occurrence (the only one we know of, incidentally) of a “Black Swan” phenomenon is enough to prove that it’s possible, not unprecedented, and so could happen again. Regarding the authors’ first reason for confidence that deterrence will work—nuclear forensics—the authors themselves admit that it is far from perfect. Its success depends in large part on the cooperation of regimes that may have reasons not to want to provide information about their own fissile material programs (either because such states are engaged in proliferation, are supporters of or sympathetic to terrorists, or are anti-“world order” in outlook, or some combination of these). Absent nearly universal cooperation from all states that have mastered the nuclear fuel cycle, nuclear forensics must be considered imperfect. Were nuclear forensics to result in only a “best guess” or high-probability estimate after a nuclear attack on American soil, our policy-makers would themselves be divided on the wisdom and justice of retaliation. Public opinion would surely be divided, with the “left” (or some loud and significant portion thereof) arguing that it would be immoral to retaliate a country without being sure. International opinion would hold the same view, only more insistently. And of course the target country itself, plus its allies and friends, and America’s major geostrategic adversaries (chiefly Russia and China) would insist on the absolute immorality of retaliation absent absolute certainty. It’s at least possible, then, that some anti-American regime has thought this same issue through, come to the same conclusion, and therefore does not feel deterred by nuclear forensics. Nor do these considerations exhaust the ways in which a culprit state might escape retaliation. One of the reasons that the United States was able to effectively (at least until Tora Bora) retaliate against the Taliban after 9/11 was because Afghanistan had no great-power patron. Pakistan and North Korea do: China. China can strike the West Coast (at least) of the United States with thermonuclear warheads. China has even threatened Los Angeles with nuclear attack in the past. Would China stand by and allow the United States to attack its client and ally? A client and ally China herself helped to arm with nuclear weapons? If Pakistani officials know or believe that China would stand by them, wouldn’t that make them less likely to be deterred? A similar consideration arises with respect to Russia and Iran. The authors acknowledge, but do not explore, the possibility that incompetence, corruption or instability might result in nuclear materials falling into the hands of terrorists. The transfer of nuclear materials owing to one of these factors is obviously much less deterrable than deliberate state action. The most one could say on that score is that fearing retaliation for a transfer the regime did not intend will make regimes take nuclear security very seriously. And we hope they all do. However, given (for instance) the rampant corruption and massive stockpiles of nuclear material in Russia, and the strong ties that Pakistani military and intelligence officials maintain with jihadis, one cannot be too confident on this score. Some have proposed a “negligence doctrine”: if your nuclear material ends up nuking me, no matter how it got here, you’re going to bear the brunt. But this poses a number of problems. The first is that, as noted, nuclear forensics is far from perfect. We will always know where a missile or bomber came from. There will be a “return address.” Our truck driver, by contrast, drove his Little Boy across the United States in a Penske rental. Terrorists could do the same and there would be no return address beyond the “signature” in the fissile material—which we might, or might not, be able to trace back to its source. This brings up the public opinion problem raised above. Second, is the “negligence doctrine” credible against Russia? The nation with the largest stockpile of nuclear material and arguably most at risk of an inadvertent transfer? Russia has, to say the least, a lot of options—including about 1,800 operationally deployed nuclear warheads, and thousands more in the stockpile—for deterring American retaliation under a negligence doctrine. A doctrine that forces the United States either to risk the end of civilization or else back down once the bluff of its non-credible threat is called is worth very little in the real world. If Russia is the country most likely to lose control of its nuclear material owing to incompetence (lax security) or corruption (sale for monetary gain), Pakistan is the country most likely to lose control through connivance or instability. That is, through the deliberate transfer of nuclear materials to an allied terrorist group by genuine regime officials, but without approval or even knowledge of the top of the government. Or else through a crisis that so weakens the authority of the Islamabad government that it’s not clear who’s in charge, and military/intelligence officials allied to or even difficult to distinguish from terrorists gain control of some part of the nuclear arsenal. In all of these cases, assuming an attack on the U.S. were proved conclusively to have been perpetrated with a given country’s nuclear material, the regime would disclaim all knowledge and intent and appeal to Washington, and to American and world public opinion for forbearance. How could we punish an entire nation for the unsanctioned—indeed, heartily condemned!—action of a rogue few? Many—including many Americans—will be asking exactly that. Would you punish the man from whose home a gun was stolen for the murder committed with it? Perhaps with probation or a fine—the international-relations equivalent of which the negligent nation would be only too happy to incur. But would you kill him? It may not be such a simple matter to muster the will for retaliation. When one considers all the times that the U.S. has forgone retaliation when it had absolutely no doubt about both an attack’s authorship and deliberate intent, this question looms even larger. Keep in mind what nuclear deterrence is: the threat to kill tens or hundreds of thousands of at least nominally innocent civilians. One might rejoin: the response to a nuclear terror attack need not be nuclear. Our conventional response to 9/11, after all, toppled a regime. True. But Pakistan and Iran are much larger and much better defended. North Korea is much more geographically formidable. All have powerful patrons and powerful abilities to harm our allies and interests. Just how credible, then, is a conventional threat? And how credible a nuclear threat? One other consideration that may seem picayune, but we believe would be relevant in the circumstance. The simplest nuclear bomb to build is, as said, a copy (however inexact) of Little Boy. Without sophisticated ways of “boosting” the yield, its explosive power would be on the order of 15 kilotons. The Hiroshima bomb, for maximum effect, was detonated at an altitude of about 1,900 feet. 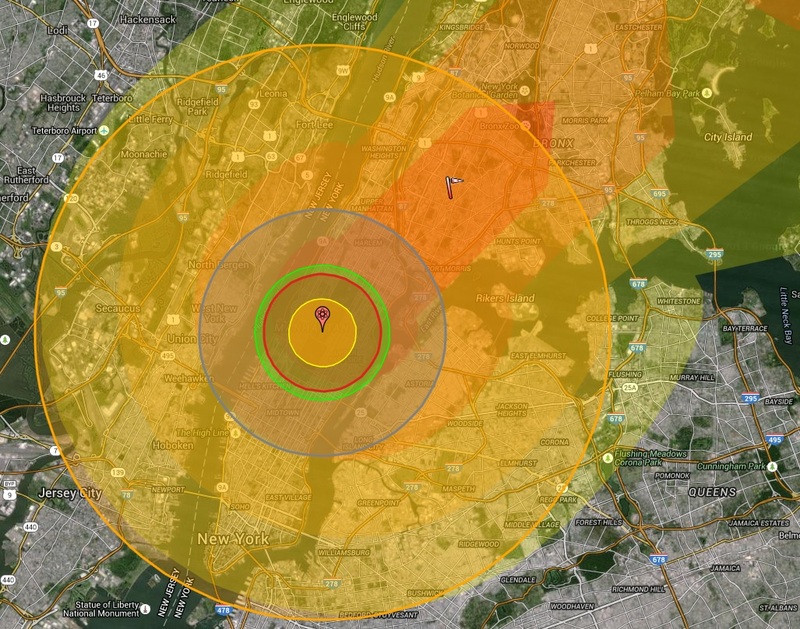 No terrorist is going to be able to air drop a bomb over Manhattan or Washington. The attack will therefore be a “ground burst” and thus much less devastating, at the same yield, than the Hiroshima bomb. Much of the world has never forgiven us for that act. To them, it would be a delicious case of just desserts if we were hit by the same style of bomb however many decades later. The fact that the effect would be even less powerful would argue, in these people’s eyes, that we “got off easy” and that no retaliation could possibly be justified. For the last several decades—you might even say half-century, since Susan Sontag’s declaration that “the white race is the cancer of human history”—it has been fashionable to “visit the sins” of Western fathers (but only Western fathers) onto Western sons. The West is forever guilty. America is still guilty for Hiroshima and a nuclear attack on American soil will be understood by billions to be justified and welcome come-uppance. Given the state of American self-loathing today, it’s at least an open question how many Americans will agree. But one thing is sure: that vein of opinion will make retaliation yet more difficult. Once again, as with nuclear forensics, if we’ve been able to think all this through, it’s at least possible that some anti-American regime has thought these same issues through, come to the same conclusion, and therefore does not feel deterred. All of this is not to say that deterrence is impossible; only that it is not enough. It is not reliable enough to be counted on in insolation. Non-proliferation can help but is no panacea. To date, no nation that has sought the bomb has been stopped purely by non-proliferation efforts. The nations that have given up either the quest for nuclear weapons (Brazil, Libya) or the weapons themselves (South Africa) have either changed their minds or changed their regimes. This is why conservative fulmination about the Iran deal is so oversold. Yes, it’s a bad deal and yes the Obama administration lied in selling it. But neither the best deal nor the absence of a deal was going to stop Iran from getting the bomb. A country as big, rich, and sophisticated as Iran—if it really wants nuclear weapons—it will get them sooner or later. Countries much smaller (Israel), poorer (North Korea) and dumber (Pakistan) have managed it. The only way to stop Iran, again, is either to change the regime’s mind or change the regime. The former would have required much tougher sanctions, plus the cooperation of all of all Europe and Russia. We were never going to get that. And even if we had, there’s no guarantee the Iranian regime would have changed its mind. North Korea never has, despite being sanctioned to the hilt for decades. Libya did only when it was caught red-handed importing nuclear materials from Pakistan—mere months after the U.S. armed forces toppled the Iraqi government. Iraq is a complicated story, but Saddam appears to have at least put his nuclear ambitions on indefinite hold after being caught (for the third time) in 1995 with an illicit program. Brazil is the only country we can think of that gave up its nuclear program owing only to sanctions and diplomacy. If you can’t change the regime’s mind, that leaves changing the regime. We at JAG have been forthright in our opinion that the second Iraq War was a mistake. That doesn’t mean the concept of “regime change” is always a mistake. This is, once again, a matter of prudence, not dogma. Regime change was the absolutely necessary culmination of World War II. It would have been unwise following the otherwise prudent first Gulf War. When the neo-cons at the time excoriated the Bush Administration for “not finishing the job,” that should have woken more of us up to the fact that their judgment had become unsound. There is little question that America would benefit from regime change in Iran. It’s hard—though not impossible—to image a regime worse for U.S. interests or more hostile to America in practice. So, while there’s always a chance that change might be for the worse, in Iran the status quo is so bad that this danger is low. But how to achieve that change? There was a chance—however slim—to help achieve it peacefully in 2009, when the Iranian people took to the streets in protest. Some calibrated American support (well short of military action, we hasten to clarify) might have given the regime a push and helped the people liberate themselves. For all his faults, President George W. Bush would likely have given the regime such a push. But by then Obama was in office. And for all their faults, the conservatives are not wrong about everything. Obama really does seem to have a reflexive instinct to insult friends and coddle enemies. He not only declined to do anything to further the “Green Revolution”; he said and did things favorable to the Islamic Republic. His motive, we believe, was to preserve that regime so that a crowning achievement of his administration could be the vaunted “deal,” the dream of liberal internationalists since 1979—their very own NixonOpeningChina. So the opportunity passed and none has arisen since. That leaves regime change by force. We need to be clear here that “bombing Iran” would not end its nuclear program and would probably make the whole situation much worse. Iran has a lot of buttons it can push to harm American, allied and Israeli—especially Israeli—interests. Bombing nuclear sites might retard the nuclear program, but at great cost. Would such a delay be worth that cost? What is our plan for what to do with that delay in the meantime? American officials of both parties, and Israeli officials too, have made these calculations and concluded: it’s not worth it. They’ll still get the bomb and we’ll pay a huge price—in Iranian retaliation and in world opinion—for our troubles. That leaves invasion. Does that sound prudent to anyone? Perhaps as a last resort. But, as noted, we’re nowhere near the last resort. America has all sorts of options for retaliating against Iranian aggression that we decline to exercise. Granted, utilizing those options is much more politically difficult with the deal now in place. But not impossible. It would require growing a spine and being willing to respond to Iranian provocations, and using our brains to think through when, where and how. The more familiar one is with the pusillanimity of the American foreign policy establishment, the more one sympathizes with neocon frustration. But by the same token, the more familiar one is with indiscriminate neocon bellicosity, the more one appreciates paleo-isolationist exasperation. The deal thus may not stop nuclear development, but it could push it underground, slow it down, make it less intense. To repeat: if Iran wants the bomb, Iran will get the bomb. The question is: does Iran want the bomb badly enough to lose all that it gained through the deal? Only time will tell. One thing we do know is that secret nukes are not that useful. The only “undeclared” nuclear power is Israel, which despite never formally acknowledging (or testing—unless they did) its arsenal has nonetheless managed to let the world “know” that it has nukes. Certainly, Iran could not celebrate the debutante ball of a nuclear power and still enjoy access the OECD economy. What they could do, however, is keep quietly working on a bomb, get all the way to the finish line—and wait. Wait until the moment when they feel they “need” to go public, until their self-perceived “need” to be recognized as a nuclear power outweighs their assessment of the usefulness of access to the Western economy. Which could be years, or decades, or longer, or never—who knows? But we do know that, all the while, that extra cash they’d be accumulating via access to the global economy could be effectively financing their program. So what do we do? Here (finally!) we get to the strategy. By all means, keep on with all those non-proliferation efforts. By all means, continue with “target hardening” and counterterrorism efforts at home. But we also have to take the fight to the enemy. We’ve observed before that the much-maligned Bush-era slogan—fight them there so we don’t have to fight them here—is dead right. Why it should be so controversial remains mysterious—beyond the obvious point that it’s been spot-welded to the neocon democracy project and thus unfairly discredited. In reality, the idea undergirding that slogan is no different than the ancient and eternal principle of the buffer state. All great powers have them. That’s one of the measures of being a great power. Can you force your borders outward, and so fight your battles somewhere other than in your own front yard—or living room? Another Bush-era slogan was “we don’t want to play whack-a-mole with terrorists.” Condoleezza Rice used to say this in interviews all the time. She meant: no one-offs but instead a grand strategy to remake the region. It’s not enough to win military victories. If that’s all we do, we’ll be fighting jihadis forever because the supply is endless. The only long-term solution is to modernize, democratize and moderate the Greater Middle East. Then and only then can we stop this fighting. And, the people there will be better off and happier, so everybody wins. Needless to say, it didn’t work out. So the Obama Administration abandoned the Greater Middle East project (we like you just the way you are, no need to change a thing! ), went into strategic retreat everywhere, and vigorously embraced “whack-a-mole.” But in the most minimalist way. To them, all whack-a-mole means is drone strikes. Drones, drones, drones. Drones + flattering Islamist America-haters is the totality of the Obama counter-terrorism strategy. The idea is to keep al-Qaida, ISIS—and whoever else may crop up—forever on their back heel and forever being forced to “rebuild the mound.” This will never be a war like World War II, in which we defeat a regime and it’s over. We’re not fighting a regime (although some regimes, including Iran, support whom we’re fighting). We’re fighting a revolutionary political movement that aspires to be a regime. More than one, actually, but since their goals are the same and they both have us in their sights, there’s no reason for us to treat them any differently. And, more precisely, what they aspire to be is a caliphate. In the attempt to revive this medieval concept, they’ve studied all the revolutionary movements of the past few centuries, with special emphasis on the Russian, Chinese and Vietnamese Communists. Their strategy is to apply those lessons to our times and their goals. To the extent that they win territory, it is with the purpose of establishing a modern caliphate. As the Iraq and Afghanistan experience have taught us, we can control territory in the Middle East—but at great cost. However, recall that the initial campaigns to topple the Taliban and Saddam each lasted less than a month. ISIS and al-Qaida are both far weaker than Saddam’s Iraq and they control less territory than the Taliban’s Afghanistan. More to the point, the U.S. military has decisively—decisively—won every battle it’s fought since 9/11, with only three exceptions: Fallujah in 2004 and Kunar in 2007 and 2011. It can defeat ISIS and al-Qaida easily and endlessly now, so long as “defeat” is defined rationally. It means: beat them. Win decisive, “kinetic”—and very public—military victories. Deny them control of territory. Shatter their pretensions of a caliphate. Channeling Cromwell: You have no caliphate. I say you have no caliphate. I will put an end to your caliphate. All their efforts will thus have to be focused on rebuilding, in perpetuity. Note: we are not saying that the right course is to endlessly bomb civilian targets so that the whole Middle East spends the next century rebuilding water mains and retaining walls. When we say “they” we mean the terrorists and the Islamists. And when we say “rebuild” we mean rebuild their political power and territorial control. Sophisticated international terror plots require the long-term control of territory and the levers of government power. The 9/11 attacks took five years to plan, during which al-Qaida was joined at the hip with the regime that controlled Afghanistan. A nuclear attack would be more difficult still and would presumably take longer and require more resources. So deny them those. Force them to start over every time and everywhere they begin to gain a foothold. We present a short example, through which we must again upset our naïvecon friends but this time we make no apology. The most likely proxy or “cut-out” for an Iranian attack on America (still the “Great Satan,” even after the Obama deal) is Hezbollah. Hezbollah, for instance, blew up the Marine barracks in 1983. They are our enemy. They are also allied with Bashar al-Assad in the Syrian Civil War. He is a bad man, and also our enemy, though not to the same determined degree. His regime is opposed by both al-Qaida (under different names) and ISIS. The “Syrian rebels” friendly or at least not hostile to the West are a naïvecon dream. So what to do? There are no “good guys.” Supporting no one would not be a terrible option since we have no good options. But right now, it probably makes the most sense to support—Assad. He is less dangerous to us than the current, rising alternatives. An Assad allied with Hezbollah is less dangerous than a Syria controlled or partially controlled by al-Qaida or Isis. Hezbollah has never controlled even a part of Syria and an Assad victory would pose little danger of such, given that the family has extensive experience in keeping Hezbollah at arm’s length and Hezbollah’s power base is in (relatively) distant Southern Lebanon. If things got to the point that Hezbollah controlled enough territory to project power against U.S. interests and began to display an appetite to do so, then treat it like another mole and whack it. In the meantime, whack the other, currently more threatening moles. And ditch the illusions that we can find philosophically simpatico allies in that worse-than-medieval part of the world. If this sounds like a recipe for endless war, it is not. It will require far less use of force than the Iraq-Afghan wars of the 2000s, which stretched on for a decade. We are essentially proposing to emulate the Romans, who made their wars “short and big.” “Six, ten or twenty days” ought to do it. But let us not dictate a timetable to prudence. The exigencies of the situation will determine the length. Saddam’s regime, with something like half a million men under arms, was defeated in three weeks. It is unlikely that we could not deliver similarly devastating blows to weaker political and military powers in shorter time frames. But what then? John Bolton was once overheard to say that his plan for U.S. policy toward post-invasion Iraq was to “give ’em a copy of the Federalist Papers and say ‘good luck’.” That certainly would have been much better than what we actually did do—not more effective, but much less costly. The point is sound. Societies that wish our help in modernizing and democratizing—and that are receptive to such endeavors—we may fruitfully help. One or the other of these criteria is not enough. Both must be present for the effort to make any sense. For us or them. But even these two, if present, may not be enough for the effort to make sense for us. The old saw that the United States cannot be the world’s policeman is half right. We can’t be, because we can’t afford to be, and because the world is not a state in which one government holds a monopoly of (just) force. We can—and should—be the policeman of our own interests. There will be many instances in which those interests coincide with the maintenance of international order. In fact, there will be more such instances of these than of the reverse. But maintenance is not necessarily change, much less improvement. We are obligated not to make things unduly worse for others as we secure our own interests. We are not obligated to expend our own blood and treasure in trying to make things better for others when such efforts do not coincide with our interests. And if the Wars of the Aughts have taught us anything, it is that, first, our well-being does not require the transformation of the benighted precincts of the world into liberal democracies. Second, the attempt can actually undermine our well-being. Third, even if our well-being did depend on democratizing the world, we don’t know how. The 100th post from the Journal of American Greatness originally published in May, 2016. We point you, without further commentary, to these words of Rupert Murdoch’s on the anti-Trumpites at the Wall Street Journal—a property his company owns in full and he controls. The 98th post from the Journal of American Greatness originally published in May, 2016. A reader asks our opinion of Ben Sasse. Honestly, we don’t know much about him. He seems like the kind of person we would have loved in 1994—or even in 2014. We’re glad he got elected to the Senate and are confident that he’s better than the alternative would have been (not that we remember who that was). the Senator who has spent his brief (speaking) time in the Senate speaking against executive overreach, against the decline of the Congress, and against putting party before country—not the potential candidate for a third party bid which he has called for but seems uninterested in. It is the later which Trump supporters and the media have recently noticed and mostly mocked, but he former seems more accurate and more interesting. Are the two so easily separable? More to the point, does Sasse himself see two Sasses or one? Or does not his diagnosis of the times (your point #1) inform his prescription for what to do (your point #2)? Thus, to him, point #1 leads directly to #2. We note as well that the reader is impressed by Sasse’s “speaking” record in the Senate. (Later in his message, he praises Sasse’s Senate speeches about the history of the Senate.) We haven’t heard or read any of them and we will take the reader’s word for it that they are fine speeches. So what? What has Sasse done? That may sound pot-kettle coming from people whose chief public activity is to blog. But at least in our capacity as editors of JAG, we are thinkers and writers. Sasse aspires to be a statesman. Statesmanship is the realm of action. Not to take anything away from writer-statesmen such as Xenophon, Caesar, Lincoln and Churchill. But you could strip away their writings and they would still be great statesmen. Strip away the actions and they would just be writers. Sasse’s only public act so far, as the reader notes, has been to call for a third party run to divide the Republican Party, stop Trump, and elect Hillary Clinton. That may be “principled.” Is it prudent? In a similar vein, there is this from Mackubin Thomas Owens, a perfect encapsulation of what we call “restorationism.” Owens praises little in the piece that we do not also love (though we question the relevance of John Stuart Mill to the American Idea). But the idea that some “return” is possible in these circumstances strikes us as absurd. What reasons could be cited to validate such a claim? We would happily trade our current government for one that worked exactly as designed in 1787, as amended in 1865 and shortly thereafter (but, we hasten to add, with a proper understanding of the 14th Amendment that excludes birthright citizenship). Do Sasse or Owens have a time machine? Ruby slippers? Click the heels and say it three times: There’s no government like the U.S. Constitution! The conditions of 2016—the state of the nation and of the people—make a such a return, if not a pipe dream, then at least far from the most urgent priority. If we are to return to proper American Constitutional government, there is much we need to fix about America first. We need to make the American people more fit for liberty. That starts with ceasing to follow polices that undermine their fitness for liberty. Secure the borders, promote their economic welfare, and stop draining their blood and treasure in pointless war. Let’s see if we can help get them back to work, off the couch, off the booze and opiates, and all the things Kevin Williamson denounces them for. Which we dutifully acknowledge are bad things. And every bad moral choice is ultimately the responsibility of the chooser. But “ultimately” does not mean “totally.” Our elites created, through self-interested policy, rotten conditions in which the virtue of the people declined. One could argue that many of those policies are consistent with some abstract conception of “liberty.” But this is just further proof that libertarians are fools. Men have passions and appetites that must be governed. In the best men, these are governed solely by the self. But in most men, self-government requires a complex web of relationships and institutions: families, friendships, churches, schools, communities, workplaces, and (gasp!) government—the state. Strip away all the others, and all you’re left with is the state. Machiavelli put it this way: fear of God can be replaced by fear of the prince. But in republics, religion is indispensable. We would include all those other things, too, but Nicky liked to be pithy. Anyway, all those others have been undermined by many factors—emphatically including bad policy—in recent years. That leaves us with only the state to bludgeon us into minimally anti-social behavior. How’s that working out? “Religion, morality, and knowledge, being necessary to good government and the happiness of mankind,” reads one clause in the Northwest Ordinance of 1787. How would you assess the state of 2016 America’s religion, morality and knowledge? These, too, have been undermined by bad policy. So why not try some good, or at least different, policies and see if we can do any better? Do what we can to burnish families, friendships, churches, schools, communities, workplaces, and even good government? We at JAG are not, to say the least, pie-eyed optimists. Yet neither are we wholly without hope. Thecycle of regimes is not always a perfect sine wave: birth, rise, peak, fall, crash, death. There areexamples of a people lapsing into corruption and then righting themselves: England after the riot of the Restoration and the revelry of the Regency are the most obvious examples. It’s not common but it’s possible. And even if a full return to the peak of American virtue (whenever that was) is not possible, surely we can do better than we are doing now. The urgent priority is implementing the Greatness Agenda, not trying vainly to restore perfect Constitutionalism in President Cruz’s first 100 days. The former may—or may not—lead to the latter (absent, of course, President Cruz). At least it holds out the hope that moving back toward the Constitutional ideal, if not to full restoration, might someday be a realistic goal. It isn’t now. Continuing to try for it to the exclusion of what is actually achievable in the here and now will yield exactly as much as that strategy has for the last 30 years: nothing. The only specific criticism Owens can muster against Trump is that Trump has shown a willingness to reach out to Sanders voters. In other words, Trump wants to win. We actually don’t see a whole lot of evidence for Trump’s feeling the Bern. But we hope he does! Aren’t the Sandernistas Americans too? Haven’t many of then been hurt by the same Davoisie policies that have hurt Trump’s Republican supporters? Second, what good have the last 16 years of Red-Blue trench warfare—which all the orthodox “conservative” candidates, our Haigs and Pétains, would merely have furthered—done for the principles Owens (and we) care about? Again: nothing. The prospect of scrambling that electoral map and really realigning our politics is as, if not more, important than the intellectual reset, which is already more than a prospect. We’ve said it before and may as well say it again. Bismarck was right: politics is the art of the possible. The restoration of Principled American Constitutional Conservatism is, right now, a distant dream. At best. It is certainly not possible unless much groundwork is laid. If you want to bench 300, first you must lift 100, then work your way up, a little at a time. Or you can load the bar to 300 and press on it ineffectually, day after day, consoling yourself that you are “principled” because you know that 300 is the “right” goal and you are too principled to settle for anything less. The bar will never move, and your muscles will continue to atrophy, but you will feel smug and lofty. That appears to be the ongoing strategy of “principled conservatism.” It may be principled, but it’s also stupid. America was strong once but we let our moral and political muscles atrophy. The Greatness Agenda is a training program to build them back up again. “I’m a conservative, but at this point, who cares?”Trump recently asked, echoing JAG’s mission statement. “We’ve got to straighten out the country.” No “conservative” intellectual has said anything remotely that intelligent since this election cycle began. Returning, before we leave you, to the reader who occasioned this missive, he asks if Sasse is “our Cicero”—that is, a final, wholly ineffectual advocate for a return to the old ways. For our judgement of Cicero’s political acumen, we refer the reader to Plutarch. For our view of the comparison of Ben Sasse to Cicero, we refer him to Lloyd Bentsen. We leave him with this thought: if a man of Cicero’s caliber completely failed to save the Roman Republic, why would anyone hope for more from Ben Sasse?